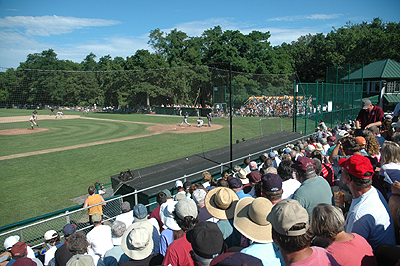 Wednesday’s game at Lowell Park had all the features of a playoff ballgame. Star pitching, timely hitting and a very vivacious crowd made the final game of the Western Divisional playoffs very exciting. A picture perfect day for the Division Championship at Lowell Park. After trading runs in the first inning the bats from both sides were left silent until a late inning rally put the game out of site for the visiting Braves. Cotuit starter Barrett Browning (Florida State) pitched arguably one of the best games Cotuit fans have seen this season. Barrett allowed a run in the first and scattered three hits until the eighth inning, showing a mix of off-speed pitches and a deadly fastball. Browning didn’t show any signs of slowing down, but an unfortunate error by his first basemen took Browning out of the game. With one out and Brad Mills on first, Justin Henry hit a sharp ground ball that was easily played by first basemen Devin Thomas. Thomas, however, made an errant throw allowing Mills to advance to third and Henry to second. What seemed to be a sure out and a possible double play turned into trouble for Cotuit as they hung onto their 2-1 lead with dear life. With two men on, manager Mike Roberts decided to go to his closer, Chris Toneguzzi to get the Kettleers out of a jam and possibly save their season. Toneguzzi came up firing and a no call on a close pitch against Ty Wright led to a glare and a few choice words from the big right handed closer. Toneguzzi seemed to lose focus after he was visibly upset over the call. This led to a Wright single that scored Mills and Henry. After losing the lead, the hard throwing Canadian righty had a few more words for the umpire that warranted an ejection from the game. This turn of events had the Kettleers totally flustered and the club was unable to recover from the disastrous eighth inning. Charles Blackmon came on to replace Toneguzzi and gave up a towering two run home run to outfielder Mike Hernandez. The homer put the icing on the cake for the Braves and the stunned Cotuit crowd told the story. Forest Cory III went punch for punch with Browning and pitched a strong eight innings to earn the victory. Cory allowed five hits and struck out three Kettleers in a game that took the left hander a few innings to settle in. Cory was able to throw some great breaking balls after he was able to really locate his fastball on the corners. The aggressive style of the Kettleers played into his hands he admits. Manager Harvey Shapiro was thrilled with Cory’s start and is honored to represent the west in the championship. Despite owning Bourne in the regular season with a 4-1-1 record, Cotuit was unable to win a game off the Braves. Cotuit finished the season with a 22-19-3 record and they were only a few lucky brakes away from a trip to the title game. The Kettleers put a great product on the field this season and Mike Roberts’ aggressive style made for many exciting lazy Cape Cod afternoon’s at the beautiful Lowell Park.